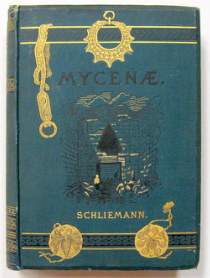 The name Mycenae only existed in Homer's 'Iliad' until 1876. Now it is a real place on the archaeo-tourist itinerary, and has given its name to a wealthy but relatively short-lived empire known as the Mycenaean Civilisation. Heinrich Schliemann was a well-educated mining engineer who made a personal fortune gold prospecting in California. A gifted linguist, he spent his well-earned leisure in the Ottoman Empire, combining his prospecting skills with his love of classical literature. This led to his belief that he had identified the site of Troy, at Hissarlik in modern Turkey, in 1871. He was up for another go in 1876, this time in the Peloponnesse. The same combination of skills and sheer good luck led Schliemann to literally strike gold at the ancient citadel we now call Mycenae. What this place was called beforehand, I can't discover. The slides below show some of the loot removed from six richly-apportioned graves. It's easy - very easy - to criticise Schliemann's brutal approach, but his disregard of anything that didn't grab his fancy shocked even contemporary diggers. Heinrich Schliemann's agenda was to locate the Iliad in time and place. He believed he had done so. He was wrong by a good 300 years and was wrong to bend the evidence to fit a hypothesis. Among the numerous findings of subsequent archaeologists is the fact that across the Aegean, from Greece and the Greek Islands through to Anatolia, the Mycenean palaces and fortifications all ended suddenly and violently. A significant layer of burning around 1200 BCE characterises these sites, and as yet we're still looking for an explanation.